#1 Internet Marketing company Asia Tips: Looking for web design? Just go to any web design company. Want to sell online and make real money? Discover secrets of making money online revealed by No.1 Internet marketing coach, eOneNet.com, ranked by top search engines. KUCHING - An Internet coaching seminar organised by eOneNet.com, a local e-business services provider, will be held here April 25 that will help businessmen to make money online, according to Ms Fione Tan, the company's president and CEO. The seminar "Internet Success System" 10-step System to start and turn any Internet business into a cash and profit generator will reveal a step-by-step approach to make money online. Besides website development, the 10 steps include finding a product that can sell online, determining the profitable model, identifying an easily targeted niche market, getting a good domain name, creating unique selling proposition for the product and compelling copy writing for the website, among others, according to Tan. She added that the key to Internet success was to follow a proven success system rather than wasting time and money in re-inventing the wheel and that the seminar was created with this objective in mind. 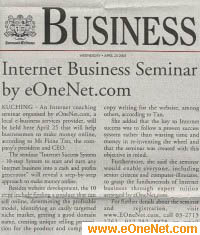 Furthermore, she said the seminar would enable everyone, including senior citizens and computer-illiterates, to grasp the fundamentals of Internet business through expert tuition arranged by eOneNet.com. "Internet Business Seminar by eOneNet.com - Sarawak Tribune Business"
eOneNet.com, ranked No.1 Internet marketing company Asia and Internet marketing coach in top search engines in Asia, offers Internet marketing seminars, Internet marketing coaching and online internet marketing services, including internet marketing strategy, search engine promotion, internet marketing SEO, internet marketing tools, and integrated internet marketing solutions in Hong Kong, Malaysia, Singapore, and other parts of Asia. More free internet marketing tips can be found in top Internet marketing Asia blog.